If the vehicle already has more than 12 months of factory warranty left, does CPO do anything other than provide 2 years of oil changes and tire rotations (which I believe are limited to a maximum of 4 in that 2 years) ? I know this blog is a little old however im going to give this a shot anyway. Im looking to buy a GMC Yukon Hybrid and im limited with selections since they are very particular trucks. Now I found some at a decent price however most of them are located at small used car dealers (mom & pop shops) not named brand dealers. My question is there a way for me to buy a truck and certify it myself after I purchased it from a non GM dealer. I also wouldn’t mind paying for the certification before buying it and if it meets the standards purchase it if not then not go through the purchase. how much would this cost if it can be done? any help is welcome. I just want peace of mind when I spend 38K on a used truck. took my car to the dealer,told me i needed frint sturts and then i was told they were a wear item so i needed to pay 300.00 of the 700 plus dollars to have it repaired. i would lpke to know why. the supervisor at the gm call center was extremely rude,and told me that she was the highest person i could talk to.i feel as though i am owed 300.00.please tell me where do i go from here! I purchased a certified 2006 Buick Lucerene back in 2010. This was my 2nd used vehicle in my life (62 yrs old). Several days after taking possession of the vehicle I noticed a blemish in the finishes clear coat on the passenger side of the car. It was small but appeared to be flaking off (just the clearcoat). I took it back to the dealership and they refused to “touch it” up. Said it was not agreed to prior to my taking possession. I was disappointed but decided to purchase an aftermarket clear coat to repair it myself in fear that it would continue to grow with time and carwashes. Note: estimates to correct it from other dealers started at $600 and went up from there. Now, almost 5 years later I can say that while my repair was aesthetically not perfect, I have not had a problem with the clear coat in that spot. Had an A/C issue 2 weeks after the purchase. Took it to another buick dealership and they corrected it (no charge) and said they replaced a bad motor mount they saw while fixing the A/C also at No Charge. I have learned to be really thorough before taking possession. I will never buy a used car that is not “Certified”. As an aside, the same buick dealership that fixed the A/C has turned out to be highly suspect. Had the car in for an oil change (was just out of the warranty period). When this dealer returned the car they gave me a report saying I needed several items fixed ASAP before they became a serious problem. The estimate was $1400. That was 3 yrs ago and have had it to several other dealerships and none of them have ever suggested those same repairs. Had an independent mechanic look at the issues they pointed out and he was baffled as well. Still have not experienced any problems they said were imminent. So KNOW your dealership! The 12 month bumper to bumper on a certified Chevy starts on the purchase date, right? 1-Year/12,000-mile bumper-t0-bumper warranty plus a 5-year/100,000-mile powertrain limited warranty. So which one is it or did I just get had? The next day I brought it home I noticed, Lic tag light out, front air dam hanging down from screw missing, no valve stems on tires, Chip in windshield, a rotten egg smell when you first start car and drive the first 5 miles, and the Diag plug broken off the clip and hanging from under the dash, and just today the ignition key got stuck in ignition because the battery went dead. So here the car sits waiting for Tuesday to roll around so I can tow it back to dealer if the battery wont charge up enough to let it start, I’m having a great Labor day weekend without a car. I have been looking for specific vehicle, and would would prefer it to be certified pre owned. I have located a vehicle I’m interested in, and when I inquired about CPO, they told me they found the program not to be worth the cost. Is there a cost to dealer to be part of this program, or is this vehicle, perhaps, not all it is made out to be? The dealer probably pays between $500 and $1000 for the certification. You can get a lower loan rate on a certified car so there is some value. I believe the powertrain warranty goes up to 6 years/70,000 miles. Generally not worth it unless you get the low interest financing. Does a CPO vehicle have to get warranty covered repairs completed at the dealership where the vehicle was covered? Asked another way, Is the CPO exclusive to the dealership at point of sale or is it honored across the GMC branded dealership network? I just purchased a 2013 Yukon Denali from Rober Brogden in Olathe KS and they told me it was a “GM Certified Pre Owned” vehicle. I was told that includes many thing including a very thorough inspection and and all necessary repairs are made before it can be certified. The Yukon had a large chip in the windshield (they said they would repair but when driven in the sun and at night the winshield had the one large and many smaller at least 20 to 25 which made driving unsafe from the glare) they will not replace the windshield and we are repeat customers with 2 other new vehicles from them. The vehicle also had the right side brake light and a right side tail light out that I noticed as we left the dealership. 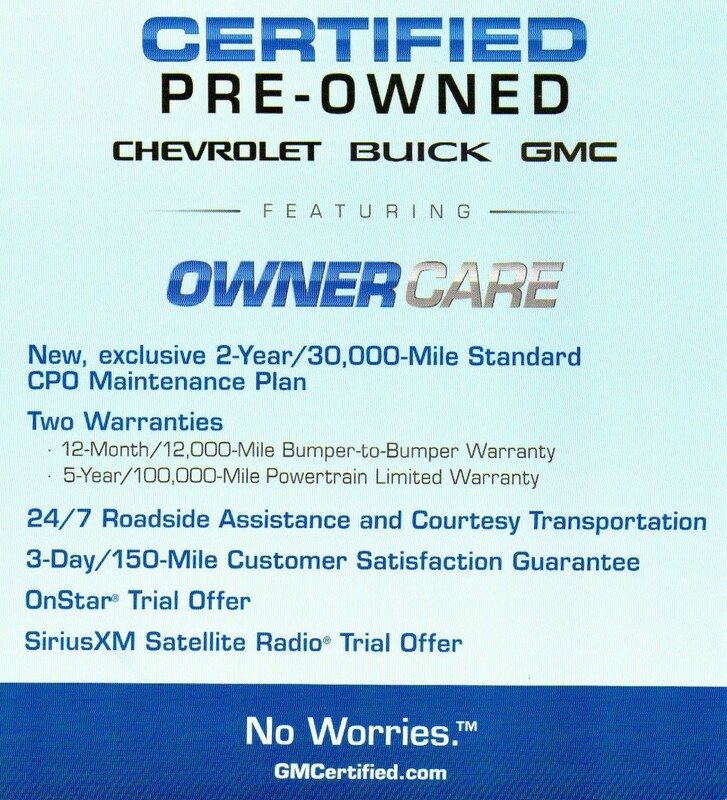 I must say that with these issues your “GM Certified” means nothing and the dealerships just use the label but do nothing as stated to certify anything. I am a retired fleet director and would never have let a vehicle like this go through an inspection and driven on the road before repairs were completed. I cant seem to get a clear answer as to what the bumper to bumper warranty actually covers. anybody really know?? The bumper to bumber warranty covers everything except Maintenance items. and other Maintenance items. If a bulb goes out its covered, it a belt breaks its covered, anything that breaks is covered by the Bumber to Bumber warranty. unless they can prove neglect. If they are saying you need to change the transmission filter that is considered Maintenance and you would pay. Dealerships and other shops are always trying to sell Transmissions Flush, Brake Fluid Flush, Engine Oil flush and other simialr items. If the owners manual does not say you need a transmission flush, Brake Fluid Flush, Engine Oil flush or whatever dont do it, they are just trying to sell crap. Follow the manufactures scheduled book for Maintenance. How do I know?? I worked at a Dealership. I bought what was advertised as a CPO cadillac ATS in 3/2/2013. I have the CPO card, saying how it “Met the exacting standards.. etc.” with my VIN number on it. Car currently has 32K miles on it and CUE stopped working last week. Brought it to local dealer to be fixed, they said it is not a CPO car! The dealership I bought it from is fixing it and giving me a loaner, due to the problem and told me they will get the car put on the CPO listing. I called Cadillac car owners number,and they said I have to take it to the dealership. They were completley unsympathetic at Cadillac, told me to work with dealer. I have all the paperwork to prove this car is a CPO, do I have to see a lawyer to get this done??? Sounds like the selling dealer took your money but never sent the CPO fee to General Motors. I guess they will fix it at their expense, so they will say you weren’t harmed. I guess it is up to you whether you sue them in small claims court. How is this a good deal? When I bought my GMC in 09, I was able to extend my CPO bumper to bumper to FOUR YEARS, 60,000 MILES from My purchase date. It had plan options and even a luxury option that covered nav, dvd, dual climate, etc. I paid about 2600 and was Never denied a repair. Ever. It was a true and full bumper to bumper. I had the dual climate head changed, the instrument cluster, multiple wheel bearings, water pump kit ($1200 if cash pay), seat belt retractors, the output yoke behind the trans for slop, and more that I cant remember… all covered. I will be taking my business elsewhere. “Four times the coverage of other makes” they stated. Interesting. My “CPO” coverage from Chrysler expires in the year 2097 and 999,999 miles for the same 2600 cost that I paid on my GMC. ITS IN WRITING from the dealership and from Chrysler so I have something to fall back on if denied.